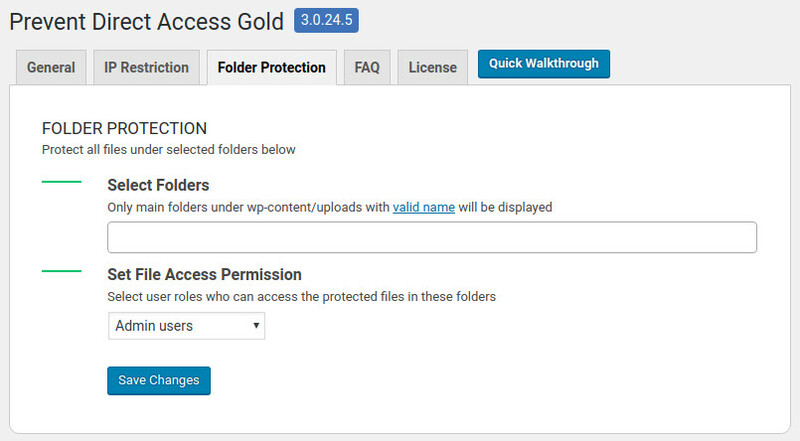 Our Prevent Direct Access (PDA) Gold plugin provides an easy way to help you protect your private files. You can either protect individual or multiple files at the same time with WordPress Bulk Actions. Now you can even protect the entire folder, i.e. all files on that folder, with the new feature of PDA Access Restriction. Unlike the file protection of PDA Gold where we move your all protected files into _pda directory, this folder protection method keeps all your file URLs as they are. At the moment, we only support protection of main folders under wp-content/uploads. Besides, only folders whose name includes alphanumerics, space and the special characters “-_” is accepted and displayed under the Select field. If you don’t see your folder under the Select filed, please make sure its name follows our plugin’s rule. We also display the default WordPress media folders such as 2018 and 2019. So if you’re to choose those folders, it may cause UI conflicts with the file protection on Media library. This option allows you to set user roles who can access all the protected files under the selected folders. “Admin users” is the default option.